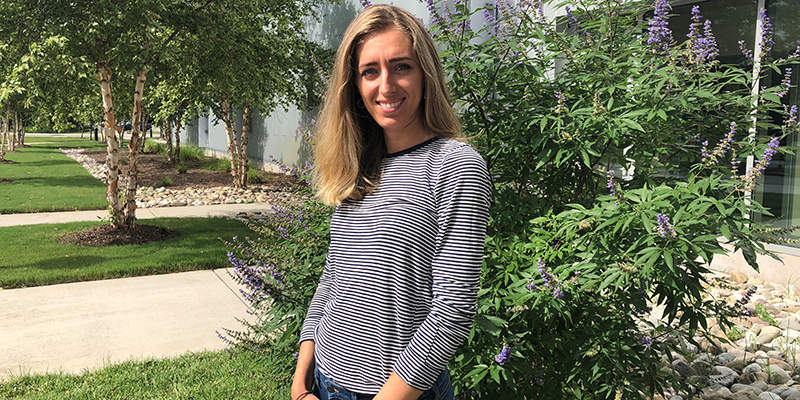 “I would never be where I am without TCC,” said Alla Topp, who just started an online master’s program in data science at Regis University in Colorado. Alla Topp is a STEM Promise Program success story even though she opted not to complete her associate degree at Tidewater Community College. “I would never be where I am without TCC,” said Topp, who just started an online master’s program in data science at Regis University in Colorado. Topp was among the inaugural class of recipients of the Women’s Center STEM Promise Program scholarship, which awards tuition and fees for two full academic years to students in select degree paths. Topp had decided on an Associate of Science in Engineering but after starting at TCC last fall realized she wasn’t a good fit for the math-heavy program. She transitioned into an Associate of Science with a Specialization in Computer Science. Topp liked the coding part of the program and particularly enjoyed classes under Professor Scott Davis. But something intrigued her even more after she attended “Women in Computer Programming,” a presentation sponsored by the Women’s Center in the Virginia Beach Student Center. Listening to keynote speaker Corren McCoy, vice president of software engineering and chief data strategist for a Norfolk consulting company, Topp wanted to know more. After talking with McCoy afterward, she envisioned herself making a career in data science. Topp had already earned a bachelor’s prior to admission to TCC; she studied human resources management at Russian State University in her native Moscow. Coupled with the relevant coursework Topp had completed already at TCC, she was a good fit to directly enter a master’s program. Meeting with a TCC academic advisor confirmed that. “Everyone was really helpful and selfless about it at TCC, encouraging me to do what was best for me,” Topp said.